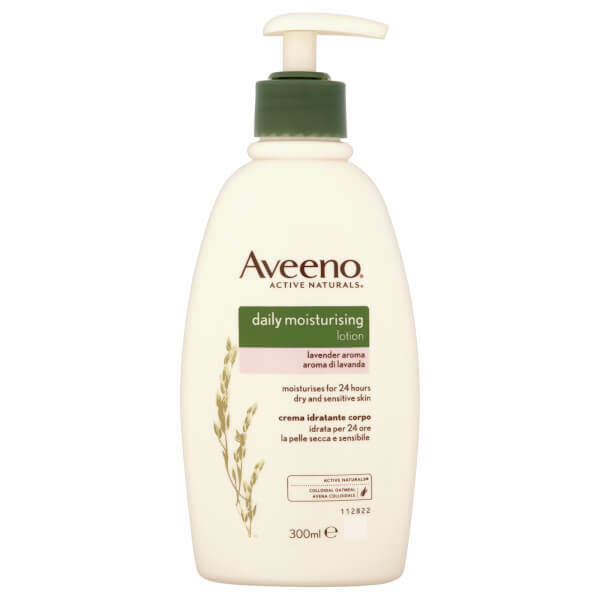 Replenish dry skin with Aveeno's Daily Moisturising Lotion - Lavender; an ultra-hydrating formula that absorbs quickly into skin to soften and condition without greasy residue. Utilising naturally active Colloidal Oatmeal (the brand's signature ingredient), the lightweight lotion delivers long-lasting moisture and hydration, whilst soothing and protecting sensitive skin from top to toe. 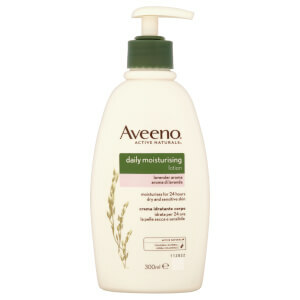 The body feels smooth, supple and comfortable with a subtle, calming Lavender fragrance. [FPT-0818] Aqua, Glycerin, Distearyldimonium Chloride, Isopropyl Palmitate, Paraffinum Liquidum, Cetyl Alcohol, Dimethicone, Avena Sativa (Oat) Kernel Flour, Cera Microcristallina, Paraffin, Stearyl Alcohol, Myristyl Alcohol, Isopropyl Alcohol, Benzyl Alcohol, Sodium Chloride, Parfum.